According to legend in Virginia City, Nevada, the Suicide Table was somehow responsible for the deaths of three people who took possession of it. It is an old bank table dating from 1860s, and the curse is directly connected to gambling. Each of the people who died also lost substantial sums of money. Two of the victims are said to have killed themselves, but one of them may have been murdered. After all, violent arguments over cards happened frequently in the western frontier. Currently, The Suicide Table has a home in the Delta Saloon. To find it, a visitor has to walk past the slot machines and go to the rear of the establishment. Protective Plexiglas encases the table, and there are plenty of informative and instructional signs explaining its history. The signage also explains the faro card game, which was its primary use. However, before the third death, the table had be converted for games of 21. 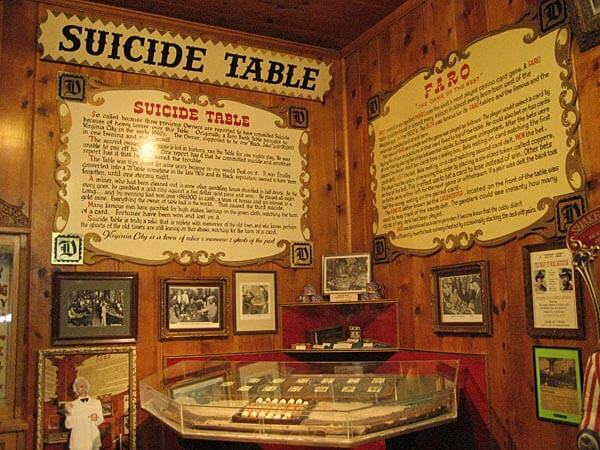 The Suicide Table is just but one oddity in Virginia City, Nevada. Over the years, the town’s haunted reputation has grown. A prospective visitor should pair seeing this attraction is part of a greater visit to the Delta Saloon. At least one hotel and a hillside cemetery is said to be haunted as well. Last updated by Rich Ristow on 01 November, 2011 in Destinations.